I have a really cool product to talk to you guys about today. 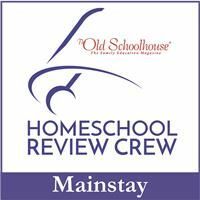 I’ve heard it described as “the homeschool product you didn’t know you needed,” and that sentiment is pretty accurate in our experience. 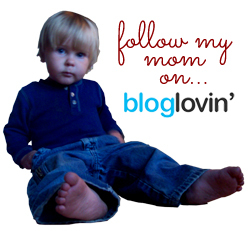 My Student Logbook is a local (to me) company owned by a homeschooling couple, and they offer . 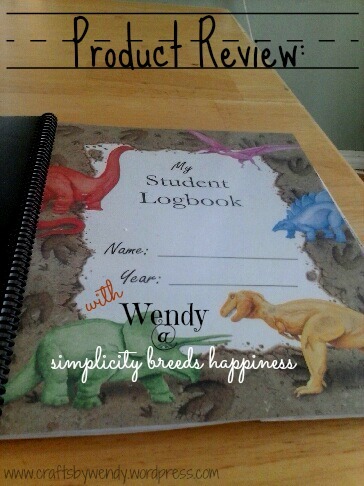 . . you guessed it: student planners for homeschooling students. 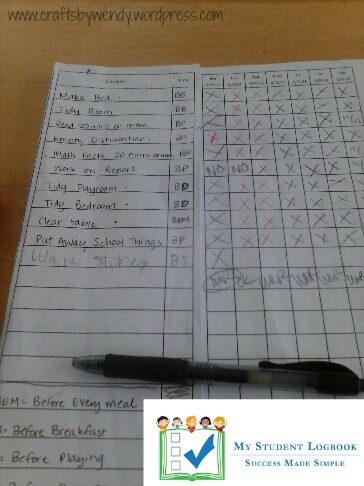 I received one student logbook for the purposes of this review, which was pretty great because my kids, Seahawk in particular (who was the beneficiary of this product), thrive on having a to-do list. The way the product works is very simple. First, you “set up” the logbook. This is done by simply tearing out one of the copies of the “tasks” page (each logbook includes several copies of this page with permission to copy more as needed), folding it in half, and taping it to the back of the current week’s checklist. Now here’s the beauty of this product . . . If your kids don’t need a new list for next week, you just turn the page to the new week and tuck it under the existing to-do list. They’re all set with a new page of check-off boxes, and you don’t have to rewrite the list. Brilliant! The logbooks are available in 3 physical formats: dated for the school year (August 1-July 31 of the current year), dated January-December, and Undated. These physical logbooks are $15 each plus shipping. We selected the school year dated version. Additionally, you can purchase a PDF version for one student ($10) or a family license ($20) and print it yourself. (PDF versions only come dated, so you’d need to buy a new one each year.) If you want to use this for more than one child, I would definitely recommend the family license PDF version. Even taking into account the printing costs, you’re still saving quite a bit of money over buying physical versions for each child. The physical products are pretty nice, though, and definitely worth the money. There are several different covers to choose from in both “boy,” “girl,” and “neutral” motifs (I selected dinosaurs for Seahawk), and there’s a soft plastic cover to protect the printed paper cover, as well as a soft plastic back cover for protection. There are several different ways you can use the My Student Logbook. Included in each book is a suggested method for keeping track of high school credits and building a high school transcript. As you know (if you’ve been a reader here for very long at all), my kids are still in elementary school, so we didn’t utilize that aspect of the book. If that’s something you need, definitely click over to read other reviews (there’ll be a link at the end of this post) because I know some of the other reviewers used this product with their older kids. We used it more as a planner than a logbook because we don’t have to keep strict records for the state; Oregon is very relaxed in the homeschooling rules. Because it came a couple of weeks before school started, we used it first as a chore planner so we could dive in right away. 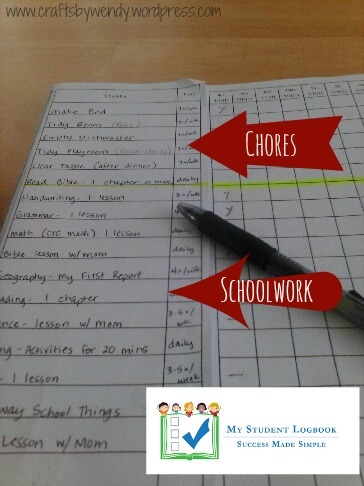 There was a list of chores (and the light schoolwork of the summer) that Seahawk was expected to do each day. He would simply put an X in the box when he’d completed the task for the day. Part of the to-do list includes a “time” box for each task. This can be used any number of ways. You can write down the expected amount of time a task should take (20 minutes). You can write down what time of day you want the item done (3:00 p.m.). The way I ran it with the chore list was using a few abbreviations, which I defined on the bottom of the page: BB (before breakfast), BP (before playing), BEM (before every meal), and BS (before sleeping). This way Seahawk knew what was expected of him at various points during the day. When school started three weeks ago, I created a new list and attached it to the appropriate page. I still included his chores on the list, and I separated the “chore list” from the “school list” with a yellow highlighter line all the way across. The visual break was really helpful for both Seahawk and me. This time, I used the “time” boxes differently. I wrote in them how many times per week a chore/subject was expected to be done (for instance, reading happens every day in our home, but grammar is only a 4x per week subject). The recommended age for My Student Logbook is 2nd grade and up, and I think that’s pretty accurate. The point of the logbook is so that the student can keep track of his/her own schedule for the day and be accountable fairly easily. As soon as your child is old enough to work fairly independently, the logbook would be a good fit. Seahawk and I both really like this product and highly recommend it. It’s a really good way to teach your kids independence when they’re younger and keep track of what they’re learning as they get older.